Dial pad shows up - hit 3-2-1. Note that this method has not met 100% success so YMMV. A better method is for a crew member to use the reset switch under the seat, on the aisle side. 2017 Sept - 8,000 AE miles - reported via complaint web page after realizing it was a faulty seat, not standard discomfort; Asked for return of eUps but they declined. 2018 Sep. $250 coupon (on a paid J TATL). Have a Service Director (SD) That Is Giving You the Case of the Shrugs? Like the real life version of this ASCII emoji -> ¯\_(ツ)_/¯ ? Please note that for the longest time, the "Green Compensation Form" version was used, and there have been recent reports of the "White Compensation Form" replacing the Green version. Reports here have indicated that the two forms are virtually identical except for the colour. I've been meaning to post this for a while. This is the whole form. The left section and the tear-off piece were filled out entirely by the SD. My name was filled out by the SD. I filled out my address, email, status, Aeroplan number, phone, and chose which type of compensation I wanted. The main part of the form goes back to the SD, and the passenger keeps the little piece on the right side. There’s a main section which the SD fills in and detachable section you get to keep. Each has a reference number. It looks like the green one to me except it’s white. Did you get a compensation form from the SD? I think the contention is, sometimes, that you have to get up find SD, have them agree it’s flat and then reset together. Otherwise you may be gaming the system. Which guarantees for me an entirely sleepless night as struggle to stay asleep even without doing the aisle tango at hourly intervals. There is a certain logic in it I guess as you could have a non-deflated seat and then just report the next morning that you had to reset it all night. At the moment if I am on an AC flight I check the seat before I put my bag down and then move immediately. Even going up to the gate and asking for GA to move me before they finalize the UGs. Life is too short. I've had a bit of a weird communication from Air Canada re: deflating seats that I thought I'd share. I had faulty seats on two flights in a row between LHR and YYZ. Was unable to move as J was full each time. Got the form from the SD on both flights. Hadn't heard anything or received compensation offer for four weeks so I submitted a customer care query. Was offered 2,000 miles (!!!) as a gesture of goodwill. Weirdly, the customer care agent seems to think I've already been provided compensation by 'the inflight team'. It's super weird as my understanding was the inflight team doesn't provide compensation, this always comes afterwards and is triggered by the white form. Am I missing something? I've pushed back and have requested compensation actually be provided, who knows what will happen. Last time I received 20,000 miles for my faulty seat so assumed I would receive the same for each flight on this itinerary given that they were both pancakes. Had anyone else experienced this particular scenario? Update to this: I’ve now been offered a 25% discount code in total for the two pancake seats. No offer of AP miles. Have pushed back again. Unfortunately the customer service rep is not terribly competent. Have asked for an offer reflecting the two deflated seats with the choice of AP miles / discount code and to speak to a manager. Anyone ever managed a call back from them? I have received calls from Customer Service apologizing for the deflated seat and informing me of the amount of AP miles that will be deposited into my account. Man, I'm jealous of all you guys getting discount codes and Aeroplan miles. Provided they were adequate, I'd much rather have those than the $500 eMCOs I got. I wasn't offered any choice, just straight up given the eMCO. I had heard from a reliable source at AC that the compensation was initially being billed back to the seat manufacturer. I wonder whether the shift to discount codes/Aeroplan miles means that they've hit the cap on compensation in that contract. I typically buy 1-2 round trips to Europe, in J, for me and my wife, every year. Typically pay low to mid $3000s for P fares. So let's say, conservatively, $2500 of ticket price that's eligible for discount. 25% x $2500 x 2 tickets = $1250, which is >2x the value of a $500 eMCO. A ticket paid for in part with eMCO may not be eligible for credit card insurance, which is a drawback, whereas discount codes are fine. The Amex promos never seem to work out for me, because either the travel window or booking window doesn't fit with what I need. canadiancow and eigenvector like this. No. I told him to let maintenance know. I just got the shrug 路. My $500 and 25% were both around 12 months ago. Are any of AC's Canadian "valued customers" - those who buy business-class tickets - deciding to opt for alternate airlines? For many destinations in Europe and Asia, if beginning in, or connecting via Toronto, Vancouver and to a lesser extent Montreal and Calgary, there exist attractive alternatives. Granted, one might forego AQM/D/S accumulation, but at some point, surely value and comfort supercede loyalty to a product that fails to live up to your expectations. I understand a higher tolerance level amongst those who have been upgraded, fly for leisure or fly for the sake of flying, but if one must hit the ground refreshed n' running on the other side of an ocean, losing the Park Bench Lottery can make a tangible difference to one's performance and/or long-term health if a frequent enough traveler. 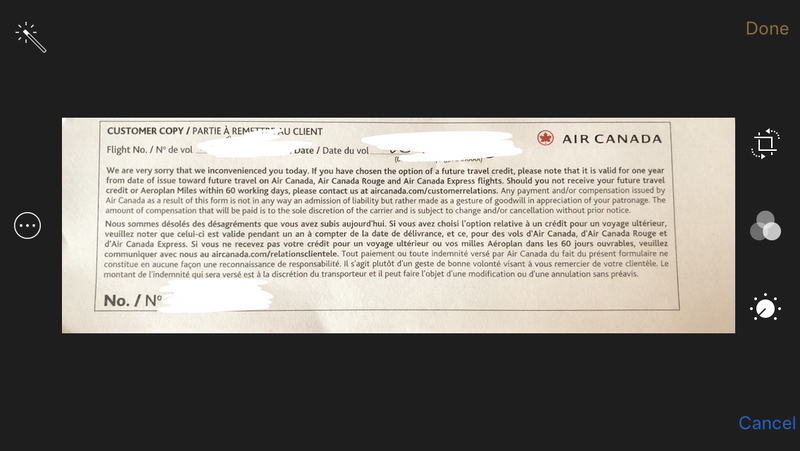 In more blunt language: why the heck do you continue to reward Air Canada? Want this fiasco resolved quickly? Fly with somebody else, and send AC a scan of your ticket receipt, or better yet, your status card with another alliance. The local business crowd aside, I simply don't understand how AC hasn't resolved this issue by now, considering how they're pimping marketing themselves as a preferred carrier between the US and Asia/Europe to the traveler with means and options. 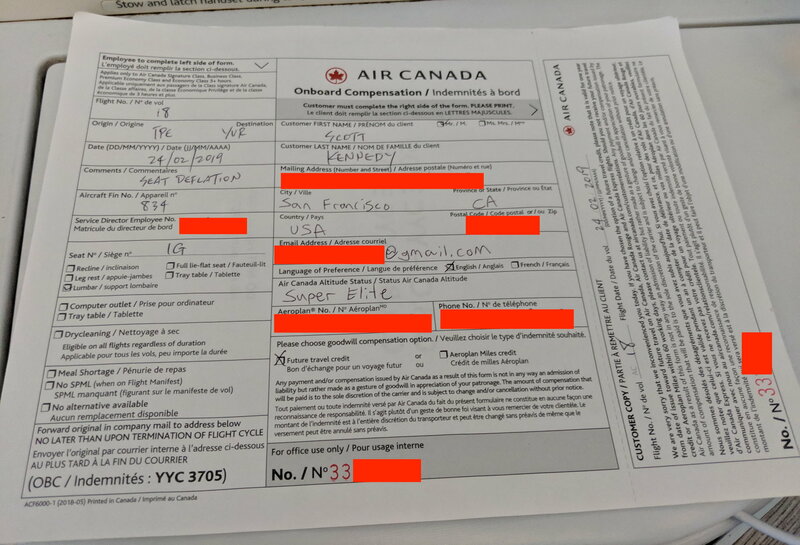 The poor sap who flies between NYC and Australia, or from Cincinnati to Hong Kong on a deflated seat is unlikely to purchase a second ticket on Air Canada. s_yvr and lallied like this. For a person that doesn't fly Business Class very often............I'm getting on AC29 tomorrow. So how do I know if the seat is deflated from the get go! @CZAMFlyer- Your point is well taken and I have begun flying on other *A partners when they offer a comparable schedule or cost. Case in point is my next TATL trip where I'm flying TP. Their hard product is not quite as nice as AC's on a good day, but I'm almost 100% guaranteed that my J seat will be comfortable enough for the four or five hours of sleep I want. And I avoid having to scrap with customer service to get some form of comp when AC fails (yet again) to deliver what they promised me. So, less stress before, during and after the flight, which is worth something to me. Even with more flights like these on other *A carriers, I'll still easily hit SE in 2019. But that's me and, while I have seen zero evidence from AC that they care about these defective seats, it's the only effective way I know to show them the same contempt they seem to show many of us. But others may not have or may not choose that option. As always, YMMV. lallied and 24left like this. Last edited by Bohemian1; Feb 6, 19 at 4:31 pm Reason: Grammar Grandma! Well, if you sit down and it feel like a hard board, that's a clue. If you lean back and feel metal rods, that's a clue. If you board and the parts are inflated but deflate in-flight, you'll notice and feel it. I've had maintenance onboard prior to my Nov AC 15 departure and that guy kept pressing the firmer-softer button (no pun intended). I told him that is not how to reset the seat. He kept at it so I told the SD he is wasting time, I didn't want him to hold up the flight so we would have to sort it later. I had 16 hours of lumbar misery on that one. The 2 SDs tried all of the various resets because the rondelle reset didn't even work. On the recent AC 4, the seat was deflated at departure, I reset with rondelle. It worked for 45 minutes or so, then deflated, then I reset again, last for just under 2 hours and so the game went for the flight. On AC 101, nothing worked and as I noted, AC 101 and AC 4 were both fin 849 and I was not in the same seat, plus others on 101 also had deflates. On AC 16 from HKG, nothing worked. And as per suggestions of others on this forum in both public and private messages to me, it seems I fly AC too often and am thus on the losing end of the AC Deflated-Seat-Lottery. I will have to decide whether I cancel upcoming trips, or take them but book nothing after that until AC decides to take this issue seriously in both the repair & replace department as well as not being so cheap in the compensation department. More than one SD in the past year made some comment that I had to move seats because the deflated seat posed safety issue. So, how does that work on a full-flight? How does that work when someone paid $5,000 for a ticket and AC's view is "well, we got you there"? And how does it work when the same aircraft turns around to fly back and another pax is in the same seat that one SD decided was not safe on the outbound? Bohemian1 and D404 like this. Maybe, we can be more diligent to post which seats on the form here so we know which ones to stay away from (Or specifically choose if you need compensation).